The Forest Hills Public School District has a “pay-to-participate” policy for all middle and high school athletics. The policy will also be reviewed at the parent Athletic Meeting. Our Sports Information Meeting will be held on Wednesday, August 29, 6:00pm.in the FHE Auditorium. Any students interested in participating in sports must have a parent/guardian attend this required meeting. Per Forest Hills Board of Education required policy, parent/guardian of athlete participating in fall, winter, late winter,and or spring sports are requested to attend the Parent Information Meeting. Team rules and interscholastic information will be shared with parents at this time. Athletes are required to have a current physical (dated after April 15, 2018) in order to participate in interscholastic athletics at EMS. This physical must be on file before his/her practice begins. We recommend you make a copy of the complete form in case you need it for another event or camp. Feel free to turn the physical in at the parent meeting or to the EMS Athletic Director before the first day of practice. Attendance by a parent at the mandatory preseason athletic meeting. Questions? Email our athletic event coordinator, Jennifer Hendricks, or call (616) 493-8850 for more information. Parents/Guardians of athletes participating in Fall, Winter, late Winter, and/or Spring sports are required to attend the Parent Informational Meeting on Wednesday, August 29, 2018 at 6:00pm in the FHE Auditorium. Team rules are distributed and discussed at this meeting. Those who are unable to attend these informational meetings must schedule an individual meeting with the athletic coordinator at EMS. When your student participates in the school interscholastic athletic program, the parents/guardians of these student athletes also commit themselves to certain responsibilities and obligations, which are outlined in the Athletic Handbook. Your signature on the Athletic Code of Conduct Contract, along with the signature of your student athlete, indicates that you understand and accept those responsibilities and obligations, and agree to cooperate with school personnel to ensure that the Athletic Code is followed. As fans and spectators of athletic events, parents/guardians of athletes play a special role in supporting their athlete, the coach and the team. Parents/Guardians of athletes are expected and encouraged to model good sportsmanship at all times during athletic events. Fall sports sign up will be during lunch on Tuesday, August 28, 2018. Practices begin Tuesday, September 4, 2018. Students interested in participating will sign-up during lunch with Mrs. Hendricks (Date to be announced). Please contact Mrs. Hendricks for middle school athletic questions, jhendricks@fhps.net. 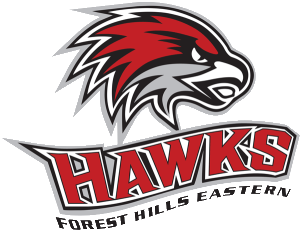 Forest Hills Eastern High School share the same campus. The school building houses students in 7th and 8th grade, as well as 9th through 12th grade.